Sallent waterfall (Salt de Sallent) is one of the more impressive waterfalls in Spain and is located near Rupit in the region Catalonia.Height of the fall is 100m approx. Salt de Sallent is not far away from Gerona (90 km) and can be reached by driving from Gerona taking road c25 near Sils. Near Vic you have to take the exit to Rupit onto road C153. The drive take at least 90 minutes.From the village you can walk to the top of Salt de Sallent in 30 minutes. The route begins at the entrance of Rupit to go to see the spectacular salt of Sallent from above and from below to the gorg. You go to the main street crossing the suspension bridge, and after the church You descend to the left by the path that borders the Rupit stream. 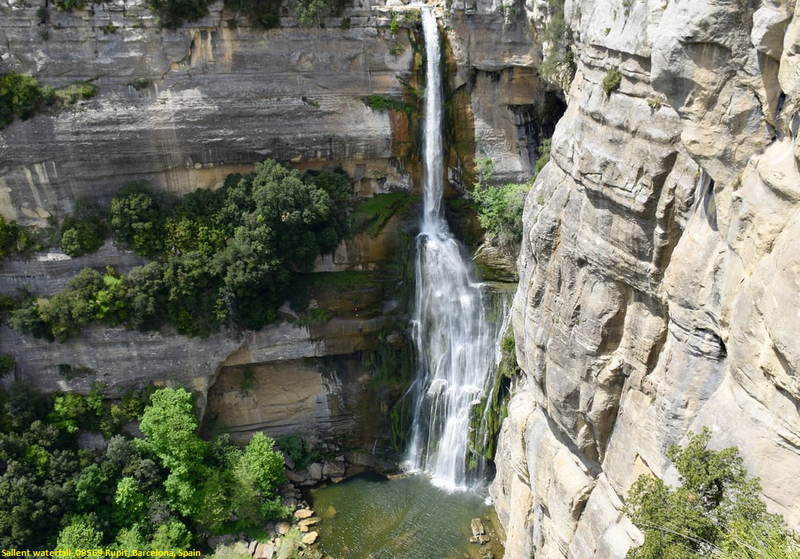 You pass through the fountain of La Pomareda and shortly after You reach the cliff where there is the waterfall. You turn to the left and then to the right You will find the Grade of Donada. After a while of descent, You will find a narrower path on the right that leads to the gorge under the jump. The place is fabulous.